Our latest rural housing scheme was handed over this week at Mark, Somerset. The 10 new homes for South Western Housing Society are located on the edge of the village and form a lovely courtyard development providing a range of homes that include bungalows, houses and apartments, to cater for a range of housing needs. The development is already fully let to people from the local area - excited to be moving in to these light and spacious homes. The development has been constructed by EG Carter Construction with a really excellent standard of finish. The homes have heating and hot water provided by Ground-Source Heat Pumps; which will keep energy costs to a minimum. This development provides an excellent benchmark for affordable rural housing. gcp have been appointed by Curo Group to develop proposals for two large residential developments in Lawrence Weston which will deliver much needed affordable homes for sale and rent in this part of the city. The first main site for 128 new homes has been developed following detailed consultation with Bristol City Council and the local community. Working closely with Curo Group and Planning Consultants GL Hearn, gcp developed detailed proposals that have been submitted and registered for planning consideration. This project will create a range of family homes in a landscaped setting that will provide a great place to live and excellent affordability for young people looking for their first property. 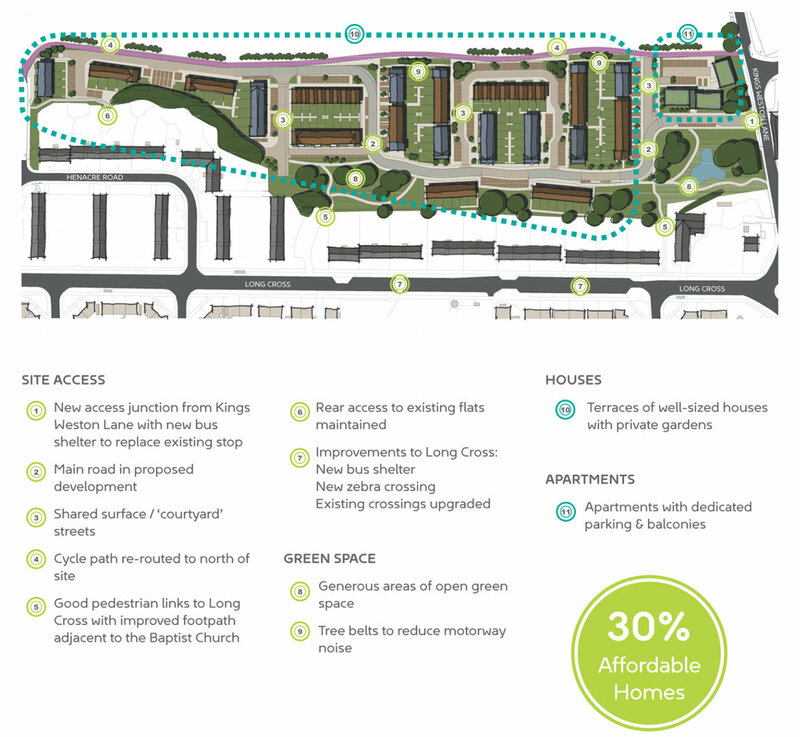 Site plan showing new homes and landscape setting. 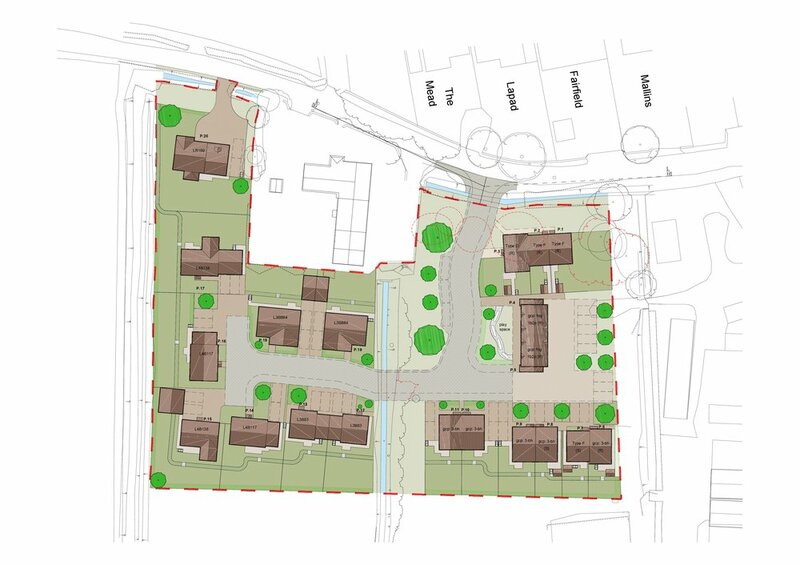 gcp have been appointed by Curo Group to develop proposals for two large residential developments in Lawrence Weston, which will deliver 185 new homes in this part of the city. The proposals at Henacre Road and Corbet Close will provide a mix of new homes for sale, affordable rent and shared ownership. Lawrence Weston is one of the first areas in the city to have adopted its own Neighbourhood Development Plan and both sites are key to delivering the residential objectives of this plan. 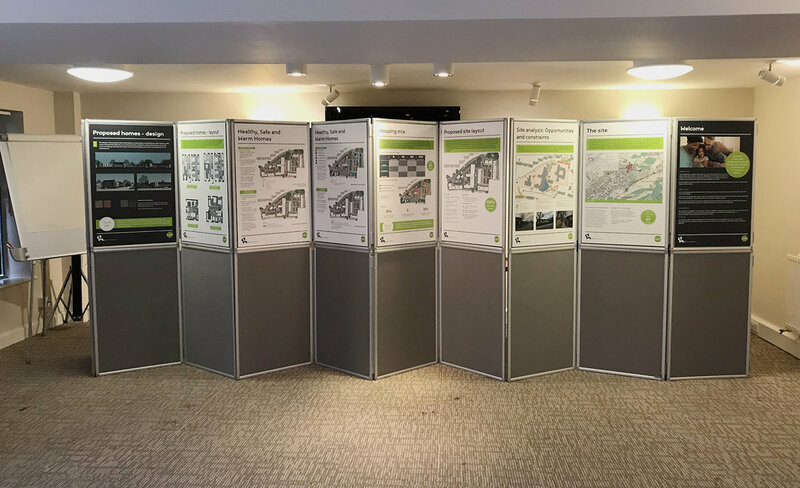 Having had detailed discussions with Ambition Lawrence Weston; the local neighbourhood planning group, the proposals were presented to the wider community at two separate open consultations in March. The proposals were generally well received with useful feedback and comments from the local community – with a lot of interest expressed in the opportunity that new affordable homes for sale and shared ownership will give to local families. The Architecture Centre along with UWE Architecture & Planning students have undertaken a mapping exercise of new housing across Bristol that highlights the variety of methods of delivery. 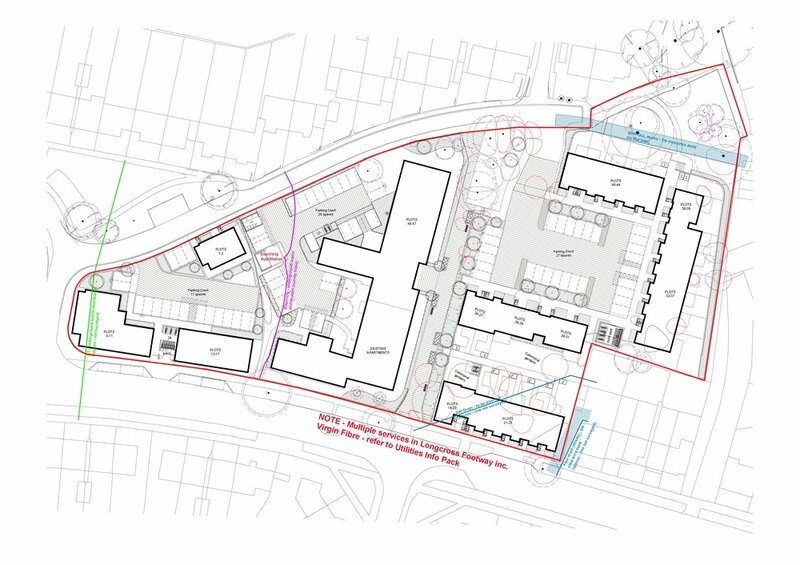 Available as a downloadable summary report, a series of case studies from individual dwellings through to large scale developments are explored, they include Torpoint and Junction 3 that were delivered by gcp Chartered Architects. 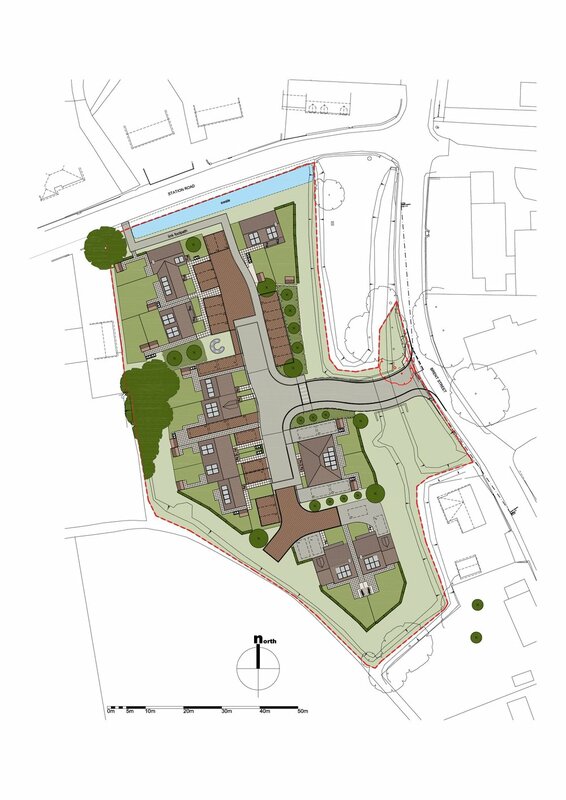 gcp have obtained planning approval from North Somerset Council for a new home in the village of Dundry to the south of Bristol. Located in green-belt, the project will replace an existing house that was very cold and draughty in the exposed location, with an extra-snug and energy efficient PassivHaus. gcp’s in-house PassivHaus designer Colin Powell, has modelled the energy performance and optimised the design to enable the client to achieve a certifiable building on completion. We are now working with the client on construction design to ensure the home will be easy and efficient for the self-build team to construct to meet the exacting PassivHaus standards. 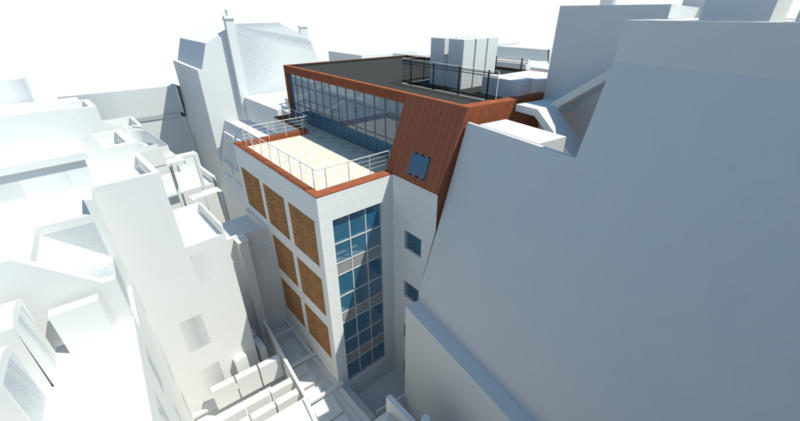 gcp secure change of use planning approval to convert offices to residential for Alliance Homes in Weston-super-Mare. The High Rise Towerblock was reclad to improve thermal efficiency, reduce heating bills and extend the life of the building. Before: Brandon House was experiencing problems with structural movement and suffering from poorinsulation leading to condensation, mould and water ingress. Photo Credits to Alumasc. Read their blog on Brandon House here. 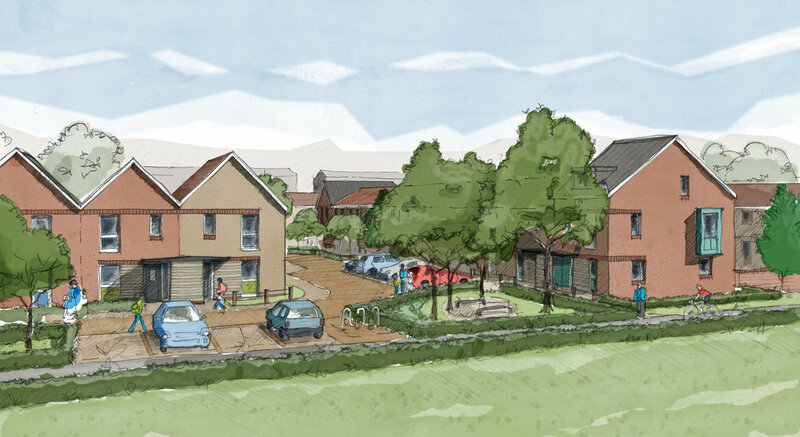 gcp have been working closely with Mark Community Land Trust and South Western Housing Society to develop a project of 12 homes which will provide affordable housing for local people in the village of Mark in the Somerset Levels. Like many rural villages homes in Mark are unaffordable for young families and people who are in low-waged rural employment. This makes it hard for people with family or work connections to find homes and stay in the village. Following a housing need survey that showed that there was a significant number of people who wanted to live in Mark but were priced out of the housing market, a group of local volunteers set up a Community Land Trust to find a solution. After a long process of testing sites and finding a willing landowner the CLT found a site and employed gcp to develop design and planning proposals. Following a period of community engagement and consultation gcp finalised a design that delivers an attractive contemporary appearance, with a mix of homes including bungalows, houses and apartments, that will meet a broad range of needs and will provide high quality, energy efficient homes for the village. 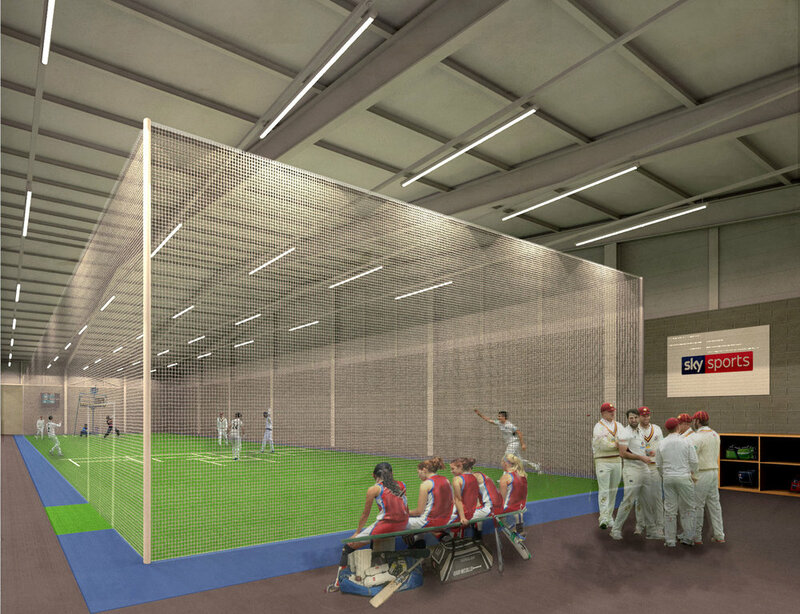 The project was submitted to Sedgemoor District Council for Planning Approval and at a full planning committee meeting this week received the support of all councillors (with one abstention). This is great news for the village and we look forward to starting the construction stage in the new year, working with EG Carter Construction to deliver the new homes for the beginning of 2018.
gcp Chartered Architects have secured planning permission for the conversion of offices to flats in the Banbury conservation area. gcp are pleased to announce Lime Property Ventures first development creating 25 student flats from a decommissioned sheltered housing scheme just off King Square in central Bristol has been delivered on time and within budget. The scheme has been developed in partnership with Bristol SU Lettings. Lime Ventures is Elim Housings new development arm. This is the 4th project gcp have worked with Elim on over the last 3 years and we are actively sourcing development opportunities for future Lime schemes. Graven Hill near Banbury is the largest development of custom / self-build homes in the country. We are pleased to be supporting a couple keen to move in to the area who are bidding for a plot in Phase 1A. Using the Plot Passport for their preferred site we have developed a compact modern home with the agreed Material Palette for that part of the site. For more information about the Graven Hill development see their September 2016 Newsletter or go to www.gravenhill.co.uk. An interesting day returning to our Oxfordshire PassivHaus project with Tim Bartlett from CVC (http://cvcdirect.co.uk/ ) to check the calibration of the ventilation system and confirm that the MVHR is working as designed. CVC have been really helpful in the design and installation of the Brink Renovent system and measuring air flows shows that all rooms are receiving the correct amount of fresh air and the almost silent MVHR is working as designed. After a year of living in their new home the client says they wouldn’t want to live in anything else! Material supplier Saint-Gobain and creator of the Multi Comfort concept have teamed up with Grand Designs to host a competition for aspiring self-builders by offering a £50k grant to the winner of a competition to design the ideal Multi Comfort home. A prerequisite of the competition is all entrants must appoint a PassivHaus-competent architect to design the dwelling. Colin Powell, architect and director at gcp Chartered Architects is a certified PassivHaus designer and is keen to take support your Grand Design aspiration. The competition is open for entries from 15th August 2016 to 15th October 2016. The sun is setting and the scaffolding has been struck on our listed building redevelopment in Clevedon. The specification was for a high performance baumit lime render system that avoids the time and environment constraints of traditional lime render. This specification was agreed with the North Somerset Conservation Officer and allowed the project to get to a water tight stage with windows fitted earlier in the programme than would normally be expected. Twinnell House, the high rise tower block refurbishment gcp have been working on for Mears and Bristol City Council, has been shortlisted in the INCA Awards 2016. This builds on past success for gcp, sps Envirowall and Woodman Brothers - this team won The Insulated Cladding Awards (INCA) in 2014 on the highly commended Junction 3. Twinnell House, a stones throw from INCA 2014 winner J3, is nominated for Best in External Wall Insulation, Domestic Refurbishment, High Rise. The winners will be announced in a London Gala Dinner in October. Read the INCA Press Release here.